At Mineola, an innovative Long Island district, administrators and teachers recognized that they were limited in their capacity to meet the unique needs of their middle schoolers. Like many districts, Mineola found that students in the fifth grade were beginning to develop and express unique personal interests and expertise. Realizing that middle school students are significantly more difficult to engage than younger grades, the district looked for ways to tap into and develop areas of student interest. After Mineola obtained a classroom set of Chromebooks, administrators were eager to pilot a new reading product —Frontier from eSpark Learning— designed to spark creativity with projects about topics students love. “Wouldn’t it be wonderful to have a smorgasbord of different choices for students and let them pick what they want to engage in, knowing all the time that because it’s tagged on the back-end, teachers are covering the standards they need to cover? That’s one of the exciting things for me about eSpark’s new product, Frontier. It’s really about choice,” explained Dr. Nagler. Frontier helps to spark creativity with projects about topics that students love. 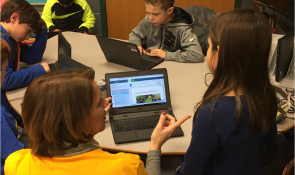 With the hope that it would speak to the needs and pedagogy of her fifth grade classroom, teacher Cindy Kopp began piloting Frontier with her students in January 2016. 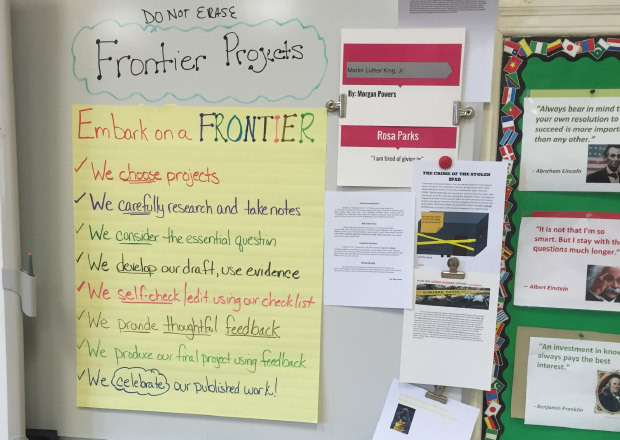 Ms. Kopp identified writing as an area of weakness for many of her students and anticipated that Frontier would not only fill this gap, but also build research and critical thinking skills. If the pilot went well, Mineola planned to expand Frontier to all fifth grade classrooms. Students spent 4-6 weeks on each question, using a variety of digital resources to inform their final project. Frontier’s curated research included articles, videos, and infographics that had been pre-selected, vetted, and organized by eSpark Learning’s team of experienced educators and data scientists. Quick quizzes checked for understanding while Frontier’s note taking feature made it easy for students to collect information to be used later in the final creation stage. After diving deep into a topic and exploring new ways of thinking, students synthesized their learning in a final creative project. Frontier allowed students to anonymously give and receive feedback on each other’s projects, and students were asked to incorporate peer feedback into their work before sharing their final projects with their teacher and publishing to an external, authentic audience. "[Frontier] makes them very excited about research... They're learning new things and they're all projects they are very interested in." 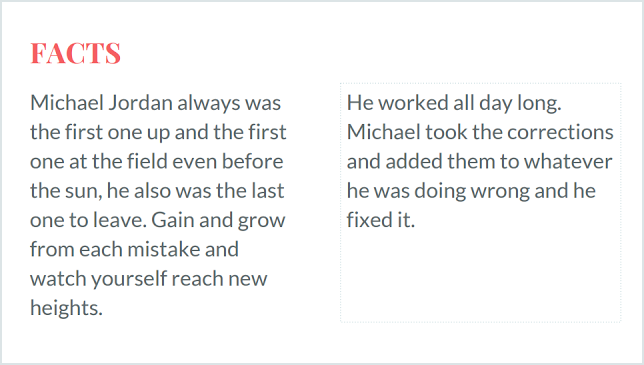 Students complete creative research and writing projects about topics such as “When is failing a good thing?” using Michael Jordan as inspiration. As a teacher, Ms. Kopp appreciates that Frontier allows students to develop their digital citizenship and critical thinking skills while ensuring that all research is appropriate for each student’s age and ability. “I don’t have to be concerned about them going online and looking at material that may not be not only not suitable to them, but also differentiated to their reading level,” she says. Matt Gaven, Principal of Mineola Middle School, is similarly impressed. “I love… the engaging topics we’ve seen so far. Our students are interested, they want to learn more, and you really can’t ask more than that. When you have a whole group of students sitting together and they all are learning about topics they get to choose, and they have high interest and engagement in, I think that’s great,” says Mr. Gaven. “Frontier gives students autonomy. Kids are so much more invested in doing research. 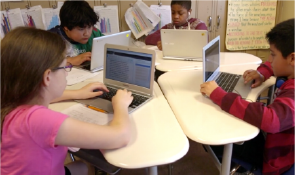 One benefit is they’re focused on the content, but the primary benefit is that they’re leading their own learning.” To build upon the pilot’s success, Mr. Gaven invested in even more devices so all fifth grade students at Mineola Middle School could engage with Frontier through the end of the school year in June 2016. "Our students are interested, they want to learn more, and you really can’t ask more than that." After just a couple months, Frontier empowered students at Mineola Middle School to invest in their own learning. High levels of engagement radiated from previously uninterested learners, and teachers felt confident in the knowledge that students were gaining research, communication, and reading skills while being creative in the classroom. Mineola’s innovation paid off in a big way as the district enhanced the fifth grade learning experience and took a new step forward in preparing students for real world success. Frontier provides students with real time feedback on their writing.